06.12.18 New feature: Even if artifact/building name is not recognized, you can still pick it from dropdown and save everything correctly. 06.12.18 Fixed a bug that some multi-reports were opened incorrectly—no need to save again, links should work. Fixed problem with parsing artefacts, should work at least for English, German and some other languages. Actually, I'm constantly monitoring possible errors and unrecognized information messages, names of buildings, artefacts etc from reports and updating translations. If your report wasn't recognized correctly, try again in a day or two. Having artefact names will help sped up that process, though. Consider sending me names of artifacts in your language in a way more suitable for you—contacts are on updated about page. Thanks for patience and using my tools. Together we can do a better tools for Travian. 01.12.18 Battle reports parser! Please, read details and comment on official legends and kingdoms forums. 09.11.18 Fixed: Teutonic scouts' training time is now affected by infantry helms. BTW I'm going to publish a new tool soon, but it's not a def.calc ... yet. 07.11.18 Thanks to Marco Nogueira, fixed in troops table: recruiting affects also rams, catapults, settlers and senators. Offense calculator was right anyway. 23.08.18 It turned out that actual speed of egyptian settlers on "Pandora" is 4, even though all guides and references give 5. I'm not sure yet, whether it's a bug or forgot-to-announce feature. According to my experience with TG, it's the latter. 08.08.18 How to calculate the most efficient army for the server with merge troops function? One option is to use the power of custom formula in attributes calculator for certain hourly production w/o gold. Merged troops costs 3x just as in Great Barracks/Stables. Quick math (you can skip to the link): for every unit produced we merge x units, hourly production = tc/t + 3x·tc/t, and off-points generated for that hourly production is a·(x+1)/t. If we express x from hourly production, we will get the following result, replace 50k with your hourly production. BTW for small production, like < 20k, formula needs to be corrected, but working with it requires changing hourly production twice. This method works for single units, what if we want to see overall picture? There's a trick in offense calculator. Since merging troops is like great barracks, it's allowed to input great barracks level > 20 to emulate merging troops. Play with it, while keeping an eye on resources needed per hour—they are conveniently displayed on the right side—and find your optimal army conmposition. 11.06.18 As it has been pointed out by Taro Malkovich, is a pretty / -effective unit with items. I added items to attributes calculator and militia is the most effective indeed. So I added militia to the offense calculator as well. On top of that I also added marksmans to defense preset. 03.11.17 Fixed several bugs on various pages, thanks everyone for reporting them. 19.10.17 Fixed a bug in off calc when changing the number of time units (hours, days, etc) didn't recalculate things properly. Adjusted UI in off calc a bit. Corrected loyalty decrease for Logades (Huns). Calculating loyalty in warsim for egyptians and huns. Fixed wall base defense for egyptians & huns—were mixed up. 11.10.17 Fixed major error: some huns units incorrectly were considered as infantry. Fixed displayed production for egyptian heroes. 08.10.17 Finally introduced the combat simulator for T5 aka Kingdoms! 04.10.17 Minor improvements to interface layout for combat simulator, should be better on phones now. 21.09.17 Huns and Egyptians now are available only in Fire&Sand where they belong. On top of that the chosen version is now rememberd across pages. 13.09.17 I looked through all my crannies and gathered all old graphics. Now almost all icons on the site change their style according to selected version. On top of that, many icons for actual T4/T5 have high-definition counterparts. 07.08.17 After some pertrubations, Egyptians were added to the site. All calculators are updated to include them as well as Huns. Please, report any error you will encounter. 31.07.17 Updated some translations [including, but not limited to] for Hebrew and Slovak. 17.10.16 Full T5 support in distance calculator. 08.02.16 Version selector was updated on most pages. On top of that, version is now auto-detected when you open my site from the game links list. This is done via a standard HTTP feature. 07.02.16 kirilloid.ru domain is 9 years old and the site is still alive. Conquering calculator now correctly stores loyalty ≥ 128 and allows to pick odd values. 03.06.15 I received several complaints, that warsim is not working in Firefox with AdBlock Plus. Just disable it for my site cause I have no ads anyway. 28.05.14 T4.4 and celebration versions added to resource development calculator. 12.05.14 Celebration server added to options. 16.10.13 Fixed bug with "jumping" menu on non-100% zoom. 10.12.12 Long-lived bug fixed: 1-letter unit names in unit's attributes calculator in Chrome. 31.05.12 Several fixes and interface adjustments. 18.01.12 New menu and two pages goes public: oases and distance calculator. Total cost column on buildings page. 13.08.11 As you may see, culture and servers pages are gone. This is intended since both pages didn't work as expected. 20.07.11 Different preferences and a pair of features from 1.0 appeared in simulator 2.0, which becomes Release Candidate. 03.06.11 New buildings' page. Simpler layout and no arrows. 29.05.11 Changed erm... something in simulator. Should render it better. 27.05.11 New icons for stats of troops in one style. Drawn by me. There will be more of them. Fixed 2 bugs with heroes in warsim (T3 mode). Mode is saved in URL. 05.05.11 Advanced descriptions for buildings updated and numerous typos corrected there. Currently for English and Russian only. If you translated my site, please, contact me about new descriptions. 18.04.11 I will test changes before introducing them. I will test changes before introducing them. I will test changes before introducing them. I will test changes before introducing them. I will test changes before introducing them. I will test changes before introducing them. I will test changes before introducing them. I will test changes before introducing them. I will test changes before introducing them. I will test changes before introducing them. 01.04.11 warsim 2.0 got T3 mode. I.e. you may use all its features for old T3.6 servers too. As you may guess, warsim 1.0 will be removed soon (in a pair of months). 09.03.11 I proudly present first simulator in the world with gull T4 features support. Except that, it is possible to simulate several attacks in a row, and several defenders of the same tribe with different upgrade levels and heroes! 08.03.11 Items reference is published. 04.03.11 It seems, that all planed changes will take rather much time, so... here are some changes for T4, but there're more to come. 14.02.11 I've created backup mirror travian.kirilloid.comyr.com, but if you want help with hosting, there's a piece of info in "about" section. 03.02.11 Due to fan site policy ads was removed. This won't affect site's stability. 31.08.10 Servers` information is taken also from index pages, which result in earlier detection of start announces. Also some minor bugs fixed. 10.07.10 Registered short domain name: krld.ru. t.krld.ru will be used in travian project for shorter URLs in battle reports. For Imperion subproject i.krld.ru may be used correspondingly. 06.07.10 Two new pages: conquering calculator and new Travian servers's announcer. 04.07.10 Combat simulator now preserve all options, you input in it (except durability artifact). Specifications are available if you're interested in. Some short description appeared on buildings page. They mostly include facts, omitted in official help and other FAQs. 22.06.10 Troops page updated. NPC calc as a separate new tool and return of amounts for upgrades will come soon. 21.05.10 Presets for Natar troops in warsim. Standard WW/WW-BP def and average def on artifacts. 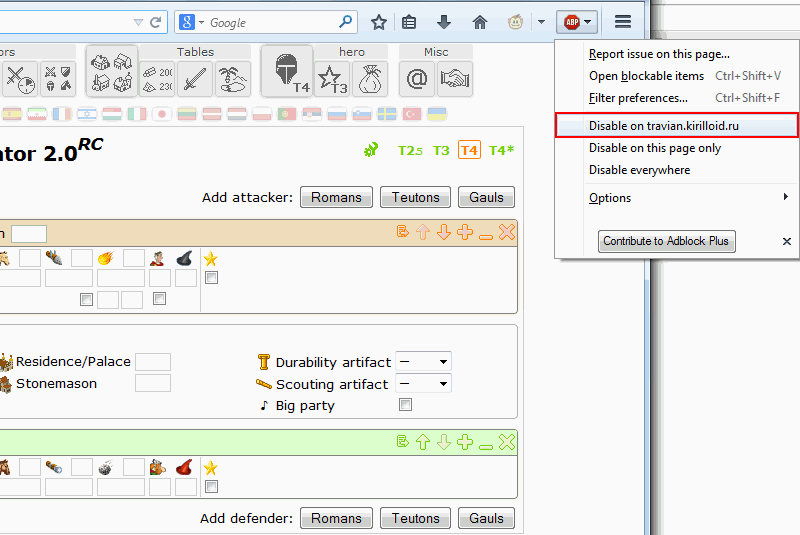 04.04.10 I've posted combat system guide on international Travian forum. 26.03.10 As you know, loyalty is halved during celebration in brewery and WW durability is unaffected by artifacts. First is fixed and for second checkbox (ignore artifact durability) is added. 10.01.10 Pre-filled fields list extended. Normal users could send examples of simulations to other players. 02.12.09 Simulator with pre-filled fields could be opened. This may be interesting for developers of scripts and other tools, example, spec. 24.11.09 Project now resides on sub-domain. 12.11.09 Warsim: Natars, scouting formula updated, a pair of cosmetics changes. Few changes in buildings and troops. New T3.5 icons. 07.06.09 Several updates in offense calculator. Choose, whether plus-offense is turned on, hero bonus and more complicated time selection. 28.05.09 Several bugs and mistypes, reported by site visitors, are fixed. Combat engine is completely rewritten for the sake of newcoming features. 25.02.09 Updating information about T3.5 is in progress. 15.02.09 A pair of bugs fixed in log generation. 03.02.09 Moved to new hosting. Everything should work. 14.01.09 Merry Christmas and happy New Year! 27.12.08 Small bug fixed in data. 25.12.08 Site now supports languages with right-to-left writing. 12.10.08 Combat simulator: Fixed for Internet Explorer & Opera; sorry for inconvenience. 2 features added. 1 bug fixed in log generation. 04.10.08 Few changes in menu. Off calculator is introduced. 28.09.08 Several minor bugs fixed in resource development calculator.